Edwards Celebrated Howard County Business Appreciation Week! 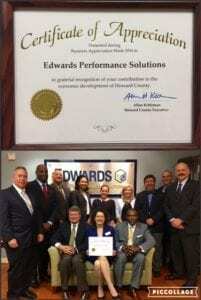 Representatives from Howard County, on behalf of County Executive Allan Kittleman, presented Edwards Performance Solutions with a Certificate of Appreciation celebrating our contribution as a Howard County business. Each year, teams of Howard County ambassadors comprised of department heads, government officials, community organizations, and employees of the Economic Development Authority join the County Executive in visiting businesses and hearing about ways to improve the business community. Presenting the certificate on behalf of the county were Leonardo McClarty (President/CEO of Howard County Chamber), Valerie Gross (President/CEO of Howard County Library System), and Mark Thompson (Vice President of Howard County Economic Development Authority). For more information about Howard County Business Appreciation Week, please visit their website.